(Bloomberg) -- Women working in the U.K.’s financial-services industry are seeing little improvement in their pay parity with male colleagues, according to the latest batch of disclosures as this year’s reporting season comes to a close. 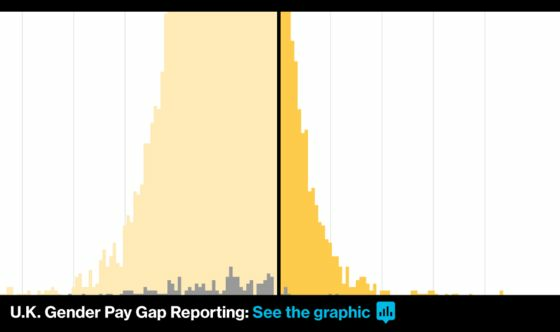 Businesses have until midnight in London to report their gender pay gap for a second year under a law that makes it mandatory to publish a uniform assessment of the difference between what men and women in their workforce earned on average. Last April’s disclosures provoked a swell of unease, prompting pledges by some of the country’s best-known companies to take action. Few have made progress, with the banking and finance sector posting some of the largest gaps on average. Female workers in British finance earned an average 26.3 percent less than men in the industry, according to an analysis of the filings available as of early afternoon in London on Thursday. That’s marginally worse than the 25.7 percent reported last year and significantly wider than the 14.2 percent average gap across all sectors, underscoring the challenges facing finance. It’s even worse when it comes to bonuses -- a major component of compensation in banking. Women in finance were paid 48.1 percent less, the data so far show. Just seven of 382 finance and insurance companies that have reported figures didn’t give a bonus figure. The numbers are a blunt assessment across the whole workforce, and don’t measure the pay of men and women doing the same job, or adjust for other factors, such as experience or location. Companies were also asked to measure their median pay gap, which compares the man in the middle of the male earnings pack with his female equivalent. Pay for female staff at HSBC Holdings Plc’s U.K. business fell further behind male colleagues in the last year, with women earning 61 percent less on a mean basis -- the biggest disparity in the industry -- and mean bonuses were less than a quarter of the average man’s. At Goldman Sachs Group Inc., the difference in the hourly wage gap was 50.6 percent, although that’s an improvement on the 56 percent gap the Wall Street firm reported a year ago. Both banks have public action plans aimed at addressing the issue. Barclays Plc reported a 49.3 percent pay gap, Standard Life Investments Ltd. was at 45 percent and Lloyds Banking Group Plc posted a 31.5 percent gap. Nationwide Building Society reported a 28 percent difference. Not one of the financial companies in the FTSE 100 has so far reported that its women earn more than men on average. She suggests changes should include measures to discourage long hours and "presenteeism" that are incompatible with caring responsibilities, better maternity policies that don’t endanger promotion, and easier part-time and job-share arrangements. Such policies are unlikely to yield fast results. Building and retaining a pipeline of talent to reach the top level of any company can take years or decades, meaning that firms’ efforts were never going to be fairly reflected in just two years of data. There’s also a lag to the data, with businesses presenting a snapshot of their workforce on April 5 of the previous year. For now, there’s little financial incentive to speed change. The Equality and Human Rights Commission, which oversees the process, last year said it would focus its efforts on those companies that failed to report at all, and declined to set fines for any underperformance. The government has also rejected lawmakers’ recommendations that firms should be required to write action plans to tackle gender inequality, something that is merely encouraged in the current rules. Some large banks, such as HSBC and Goldman Sachs, have published details of their disparity anyway, alongside strategies and targets to tackle the issue. Some firms reported limited progress. Blackstone Group LP, one of the only large private-equity groups to submit data, said hiring more women for investment and senior support roles helped reduce its mean U.K. bonus gap -- albeit to a still eye-watering 67.7 percent, down from 75.4 percent. "I wasn’t expecting to see huge changes after the first year," says Dominie Moss, who runs The Return Hub, a recruitment agency for those resuming work after a career break. "There’s no silver bullet."